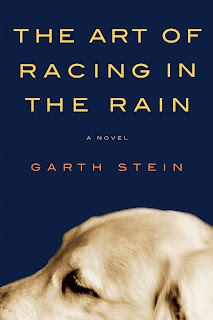 Garth Stein’s The Art of Racing in the Rain narrated by Enzo the dog shows us just how similar sentient beings can be in their emotions, connections, and reactions. Enzo is just a pup when he meets his new owner and friend Denny, and his life is all about racing and being a companion. When Denny meets Eve, Enzo must make adjustments and learn to fit new people into his life. Denny and Eve have a daughter Zoe, and Denny makes his way in the racing world until things start to go awry. Stein has a way with words that captures the essence of Enzo and his devotion to his family. Readers will enjoy Enzo’s theories about reincarnation, family life, human communication, and more. Enzo’s examination of why dogs do not have thumbs and how humans have bred them that way and why is humorous. There is a great deal of racing jargon and discussion in the book, but readers will find these serve more to help Enzo explain his feelings about the events of his life and how his family dynamics work. Overall, The Art of Racing in the Rain is a fast-paced, enjoyable read, but be prepared for some tugging of the heart strings. The Art of Racing in the Rain by Garth Stein was my selection for the Dog Days of Summer 2009, sponsored by The Literate Housewife. You have until Aug. 28 to vote for Charlee in the Dog Days of Summer Photo Contest. Help a Hot Dog out! 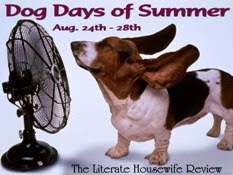 As you know, this week kicks of the Dog Days of Summer 2009 reading challenge and giveaway at The Literate Housewife. Your first task is to head on over to The Literate Housewife and vote on your favorite summer photo featuring dogs. Of course, you’re wondering why I’m talking about this. . . well, you shouldn’t be. 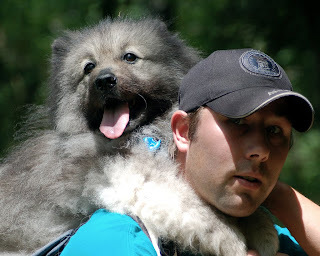 My hubby and Keeshond Charlee are up in the poll. Check them out and vote! I hope you will vote for them. It was a really hot day camping and hiking. Meanwhile, I should be posting a great review of The Art of Racing in the Rain sometime this week. Stay tuned for other announcements about the Dog Days of Summer 2009. Also, I have a great international giveaway for the Rooftops of Tehran going on through August 24, 2009. Have you heard about the Dog Days of Summer celebration put together by The Literate Housewife? All you have to do is read and review one of the books she’s reviewing that week and post your review between August 24 and August 28. Part 3 is to comment on The Literate Housewife‘s reviews for additional entries into the bookmarks giveaway. I hope you will all join in the fun.